One of the things that attracted me to our home when we bought it ten years ago was the large tray ceiling in the master bedroom. In addition to making the room feel larger and grander than it really is, it provides a lot of architectural interest. We've been happy with our tray ceiling as it is, but I've always felt that it had potential to be even more spectacular. Sometimes I lay in bed, look up at the ceiling and dream about different design possibilities. My ideas include thick, custom, crown molding and a beautiful paint color to highlight the tray and really make it fabulous design feature. Thanks to Sherwin-Williams and BlogHer, these little dreams are about to come true. Sherwin-Williams has asked me to partner with them for a room makeover. Our master bedroom is my room of choice. 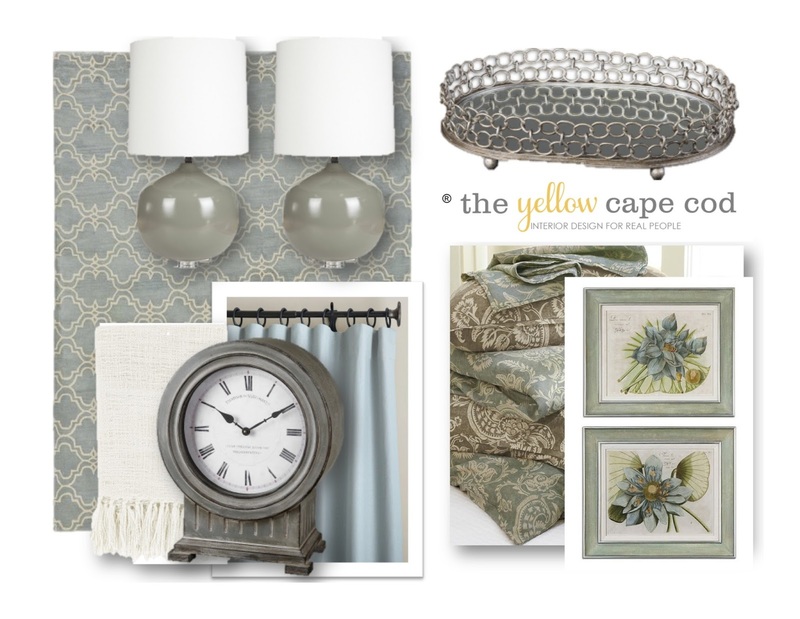 My plans include freshening up the room with an exciting new paint color, bedding, decor and accessories. The biggest change in the space will be enhancing the tray ceiling with Sherwin-Williams Harmony® Paint and custom moldings. I can't wait to try their new Harmony paint line. The Harmony® Paint line has no VOC's which means we should avoid the typical wet paint smells while working on this project. Not only does it hardly smell like paint it actually helps reduce other common indoor odors from your pets, cooking and daily life to help rooms stay fresher longer. Harmony® Paint contains new technology that helps promote better indoor air quality by reducing VOC levels from potential sources like carpet, cabinets and fabrics. 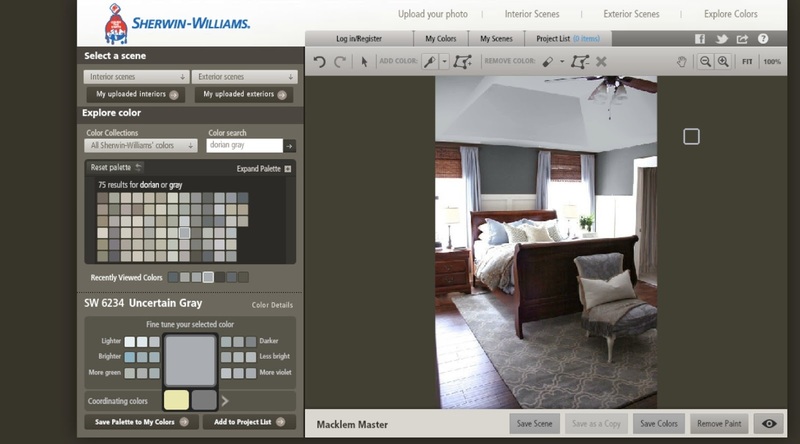 Before testing new paint colors in the actual space, I visited the Sherwin-Williams website to learn about their color selection tools. I chose to use their Color Visualizer to take some of the guess work out of choosing a new color. This tool allows you to picture it before you paint it. The powerful Color Visualizer turns your computer into a virtual design studio. It allows you to see what different colors will look like in your space before picking up a paint brush. After I uploaded photos of my space, I used some of my tried-and-true favorite Sherwin-Williams paint colors to create realistic mocks up of my space painted in these shades. You can see what a difference replacing our chocolate brown walls with a nice warm gray like SW 6254 Lazy Gray or SW 7645 Thunder Gray makes in the space. In the screen shot below, you can see how SW 0055 Light French Gray really lightens up the room. 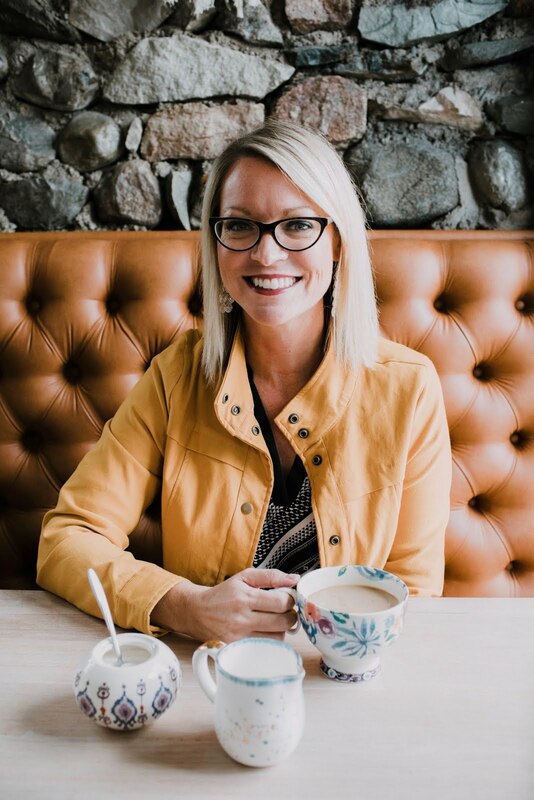 Once I went through my list of favorite Sherwin-Williams grays, I ventured into new color territories and discovered some new favorites (including the final color I chose to use in my makeover). After I narrowed down my favorite wall colors, I started to play around with different shades on the ceiling. This tool is very easy to use. 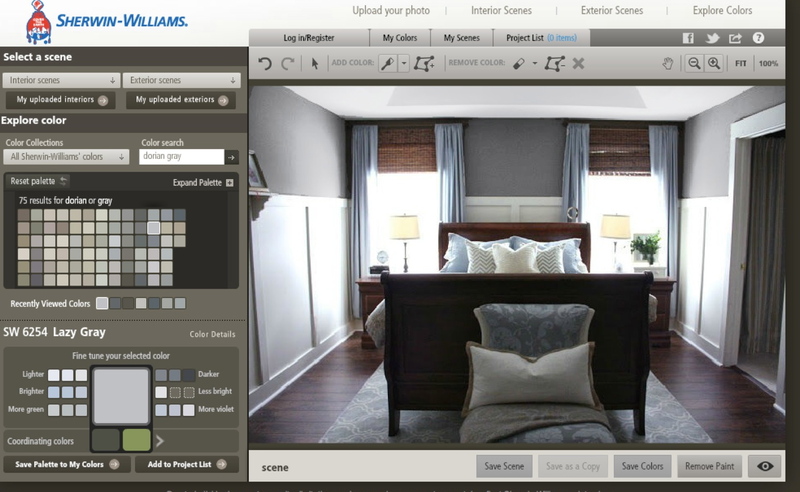 If you don't have a photo of your space to upload, you can still experiment with different color combinations by using one of the interior or exterior scenes available. Once you have found your perfect palette, you can share it with all your friends on social media. You can also print out the color information along with a coupon to take to your local Sherwin-Williams store. 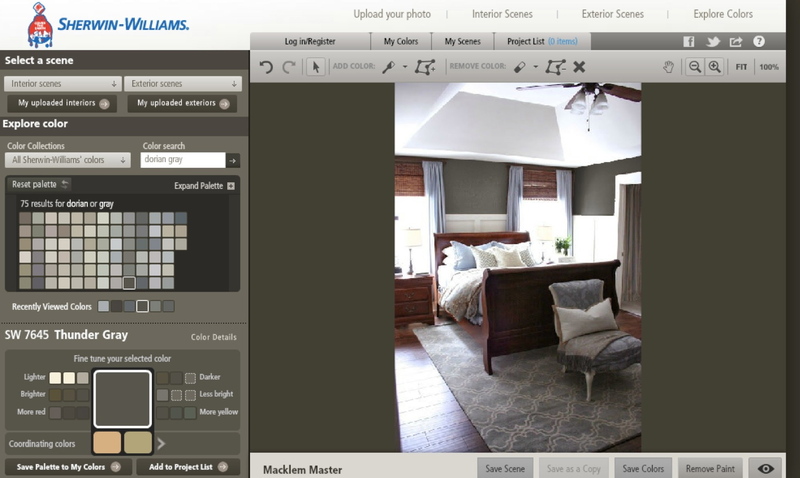 When I was done using the Color Visualizer, I compared my Color Visualizer room mock ups to the design board I created for my new bedroom. You guys know me, I always start every room makeover with a design board. Here you can see some of the new elements I'll be incorporating into my new master bedroom. The style I'm going for is the traditional twist. It's overall traditional in design with a contemporary twist. While keeping the space casual, comfortable and inviting I'd like it to have elements of luxury. This design will be achieved by layering fabrics, prints and finishes in combination with my spectacular new ceiling treatment. Here is what my mood board looks like next to one of my favorite Color Visualizer paint palettes. The Color Visualizer has given me a really good idea of what my room new room will look like. It helped me to finalize my paint color choice and I'm so excited to share it with you. 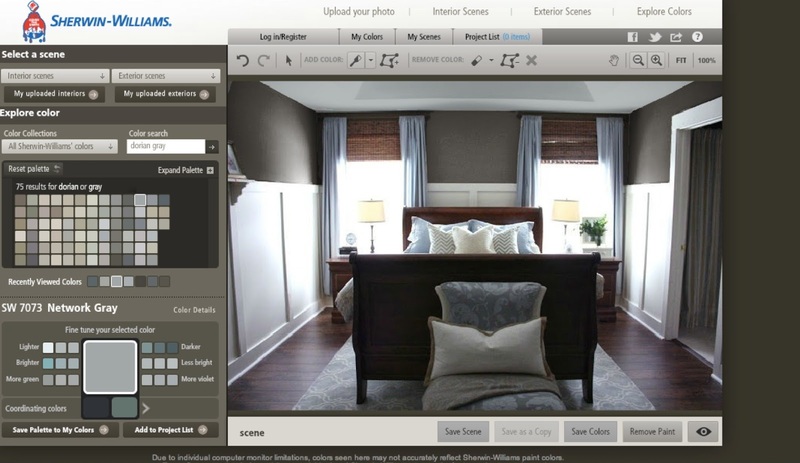 Stay tuned for the dramatic "after" photos of my master bedroom featuring my new favorite Sherwin-Williams color that I discovered using the Color Visualizer tool! 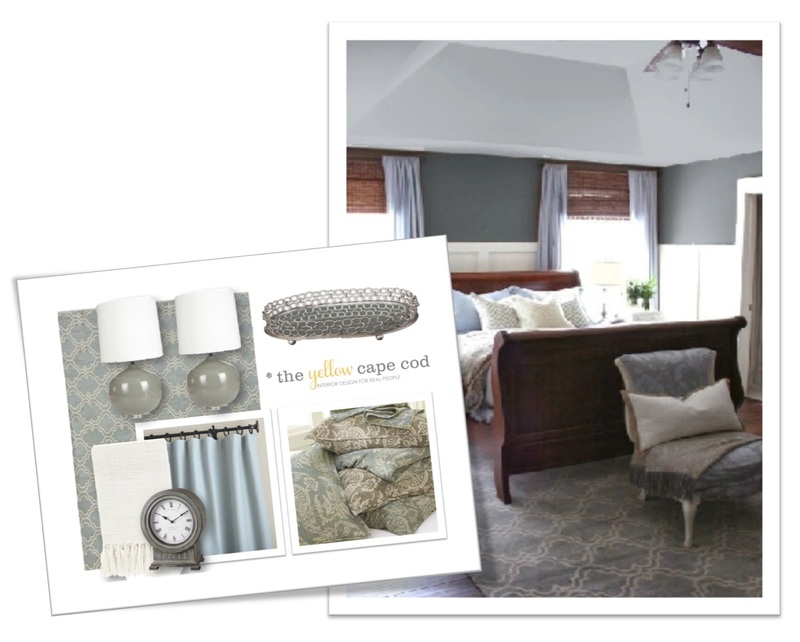 What room would you makeover with Sherwin-Williams? You can find your friends at Sherwin-Williams on Facebook, Twitter, and Instagram. 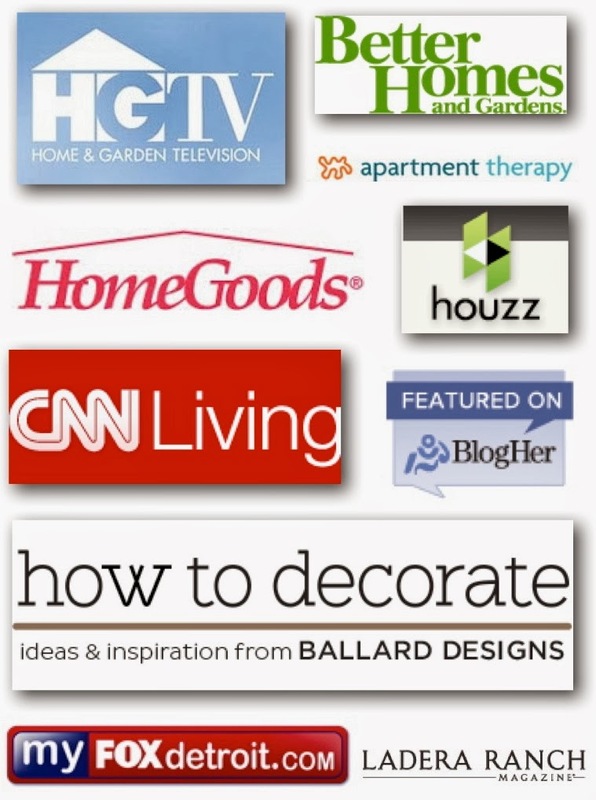 Be sure to visit the Sherwin-Williams brand page on BlogHer.com where you can read other bloggersâ€™ posts! I would makeover our guest bedroom - it needs a fresh coat of paint (or two)! I would make over my master as well, i keep waffling on the color! I have a living/great room in need of updating and fresh paint. My master bedroom, I have put it off to the last! We would do our 15 year olds room/bathroom. Also, the master bedroom. Funny how that always seems to be the last room on the list! Also the master bedroom. Funny how that room is always the last on the list! I've used it several times, it's a great tool! Right now I'm using it to pick a new color for my family room. My dining room is ready for a makeover! Only one room in my house has not been painted since our move here in 2009 - The guest room. All rooms painted with Sherwin Williams and would use nothing else! I would makeover my great room if I won the gift card! I would love to redo our family room! I would makeover our living room/kitchen area because it is open concept. We moved into the house with bright yellow walls. My Sherwin -Williams room would be a bathroom which is in desperate need of new paint and updating. On my to do list this summer is painting my living room. I also wish to replace the carpet with the laminate flooring you used in your upstairs space. Thanks for the chance to win this awesome giveaway. Oh I would definitely do the master bedroom too. I can't wait to see yours all done and I am definitely going to use the Sherwin Williams Color Visualizer. They have been my go to paint company for years. I just painted my living room & kitchen/dining with sherwin Williams! I would love to redo my girls rooms w/ there paint! Definitely our spare room...which will hopefully be a nursery soon! My kitchen dining living rooms are all one open area that I just cant seem to get right. How to make them flow is puzzling to me. I would do this area. My kitchen, dining, and living room are one open space. I have trouble making them flow. This is the area I would do. I must try the color visualizer. I am not happy with the color in my master bedroom - so boring and drab! I would make over our front porch and side yard. I want to paint my front door a fun color like aqua and build a fence and paint it crisp white. Our great room in our " new to us " condo......definitely needs some personalization as we embark on this empty nest! Our master bedroom definitely needs a makeover! I've been slowing working on every room in the house except that one. :/ It's time to show it some love! I just adore Sherwin Williams... But that new tool I have to try... and my master would be the first one to redo! Off to take pics and try out the new colors SW has. I would probably do our bedroom, too! It's the one space in the house we haven't done much to yet. Our master bedroom. It's the only room we haven't painted since moving in Labor Day weekend, and I'm more than ready to put up curtains and get rid if the dark blue on the walls! I would make over our master bedroom. I love the colors at Sherwin Williams! Our formal living room! I have put off doing anything to it for 3 years, and I think it is time! Love Sherwin Williams. It's the paint we used exclusively in our last house. Just moved into a new house that was freshly painted by I would still repaint our bedroom, probably with Rainwashed... such a lovely shade! Definitely our master bedroom as well. Since moving in a year ago it's the one room(s) that we haven't touched. I would love to add some color to our family room! My living/kitchen area could use a good makeover. I would makeover my powder room! We love Sherwin Williams! My master bedroom is due for a makeover as well! I am just waiting for it to warm up a little (and less rainy) to paint my master bedroom. I used the Sherwin Williams tool to pick out my color- I can't wait to use it for some other rooms! Most definitely the living room. It is currently filled with college furniture, half destroyed by our toddlers... we need new stuff in there, STAT! I would do my kids bedrooms since they have both moved out their rooms definitely need some fresh paint. I would redo my master bedroom. We bought our house almost three years ago and still only have one picture on the bedroom walls. The bedroom furniture from our old place doesn't fit quite right with our new space and the color on the walls is quite boring. I would redo my master bedroom. We bought our house three years ago and have decorated all the rest of the spaces except this one. I would love to get a new color on the walls and some art and new furniture as our old furniture doesn't fit quite right in this space. Can't wait to see how your bedroom turns out! I would makeover my master bedroom (thanks for the inspiration!)!!!! That new visualizer tool looks super cool and handy! The in-law suite in my basement. It needs a good dose of SOMETHING, and paint could make a huge difference quickly! I would definitely redo the basement playroom! I always buy my paint at SW, love them! I would re-do my family room if I won. I just love SW! I would re-do my family room. I would makeover our master bedroom too! It needs to be a retreat, and I'm dying to make it fabulous! The family room is needing an update. That gift card would go a long ways towards new sofas! We are also needing new paint and some pretty "fluff" to finish off the room! I would make over my kitchen/hearth room area. I can't wait to try out the visualizer. We just repainted our master and it makes a HUGE difference. If I won I would give the same treatment to the guest bedroom that was a nursery for the previous owners. I would make over my dining room. Our bedroom needs some color. I would prefer a soothing blue. I have used the visualizer and chipit! and find that it helps tremendously with my paint color decisions. A guest bedroom is next up for a redo & repurpose coming out on the other end as a home office. My master bedroom. I would love a new paint color and find a way to lighten and brighten it up! My kitchen is in major need of a paint job. I love Sherwin-Williams paint! Dining & living room are next on my list. I just redid the powder room with Sherwin-Williams Urbane Bronze and I'm in love! I would do our master room. It is need of some TLC, Thanks for the chance. 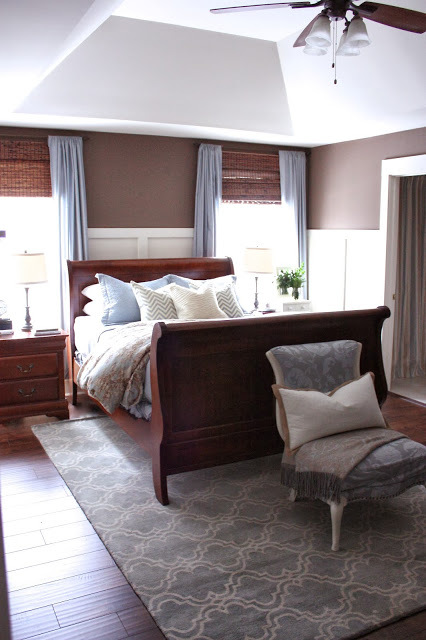 Toni M.
love what you plan on doing to your master bedroom! My master has been waiting to be redone forever! Would love to win, SW is always my go to paint! I would love to tackle our master bedroom, too. It just keeps getting pushed to the bottom of the list against other rooms. My DARK Olive Green walls in my master are screaming what was current about 10 years ago. So it's definitely time to give it some new (current) paint color. I would make over my master bedroom! I love your style and the idea of story boards! How do you do that? I would make over my living room - I can't seem to find a "function" for this room so it is difficult to design. As it is the first room anyone sees entering my home, I would like it to be warm and inviting, but with a purpose. I would love to try the new paint line in our home! I would love to repaint our master bedroom...it is truly our little retreat from the world! I would make over my bedroom. It needs some brightening up! So many rooms to choose but I would probably tackle my living room first, then the master, then the basement!!! I would also redecorate our bedroom- I think I will try out the SW website to explore colors! My basement family room is ready for an update! I would makeover the bedroom that my 5 yr old son and 3 year old daughter asked to share. I'm not sure how to personalize it for each yet make it one cohesive space. I would redo our living room/dining room. Needs new color. I would love to makeover our master bedroom! It has been a headache since the day we moved in. It is a huge room with a poor layout, and I think using paint to break up the space would be a great place to start. Especially since the attached master bath is mismatched to the bedroom. I love the low VOC in the Harmony Paint, as well, given that I am an expectant mommy! Our finished basement is the room I would choose to makeover. We haven't painted it since we moved in 12 years ago. It's desperate for an update. Love what you have done with your Master!!! I would love get our master bedroom finished!! It's the one project in our home that just gets put on the back burner!! I would love to try a dark color with some nice crisp white bead board!! I would makeover my master suite. It is a huge space with a poor layout, and I think breaking up the space with paint would be a good place to start. I love the low VOC paint in the Harmony Paint line, given that I am an expectant mommy. I would do my master bathroom. I love the Sherwin Williams color in our living room (Dry Dock). But I need to paint our office next. It needs a little more personality. I'd make over my family room. It's got gold walls with brown, orange and green accents. I think it's time for an overhaul! :) LOVE your blog. It's my favorite. I would make over our master bedroom, which sadly has not been touched since we moved in and includes entirely too much beige! we just finished our master bedroom suite and used Sherwin Williams Aqueduct and it turned out beautiful!!! Our next project is the kitchen and have selected Sherwin Williams Banana Cream. we love the quality of Sherwin Williams! I'm in the process of doing my kitchen and I changed it from SW Netsuke to SW Pussywillow to match my cabinets that I painted in SW Pure White. I absolutely love my new gray walls. It truly looks wonderful. I'm proud that I did the work myself. Definitely using an inspiration board helped me with this project. I'm definitely going to check out this paint visualizer - we are planning to paint the inside of our house this summer. Love your blog! I would make over my new son's room. This is our fourth and the room really needs a makeover since it is just a generic grey. My wife is desperate for a new nursery. We are moving next month to a fixer upper and I would start by painting all the bedrooms upstairs. I would make over the master bedroom. Your master bedroom is beautiful. Thank you for the chance. my living room needs an update and we are getting ready to finish our basement. It would be awesome to win this! I would definitely do my master bedroom! It is in desperate need of a makeover! I would give the dining room a makeover, it has potential, but very little natural light so it is dark. I also would like to see it become a multi purpose space to serve as an office/library when we aren't using it as a dining room! Lots of wood to paint light and bright! It's definitely time for the bedroom to change from SW china doll to ???? It's definitely time to change the master bedroom form SW China Doll to ????????? I would say our kitchen/dining area since it is the first room people see when they come into our house! I would love to make over my dining room. We moved into our home five years ago, and the previous owners used the room to corral their large dogs. The visualizer would help take out the guess work! Oh, I'd love to redo our living room!!! Desperately time for it to happen! Any room in my house could use a makeover. Your room is looking good. I would like to do the bedroom also. Thank you for the great information about the Sherwin Williams paint tools. I will definitely being trying that out as I want to update the family room with a modern color and design but keep the cozy, comfy feel we all love in the room. The paint tool will certainly save me some time! I would make over the living room. My Dinning Room need some major decorative direction! My dinning room needs some major decorative direction! I would make over my great room/kitchen area. It's time. I would make over my bedroom. We would like to convert our dining room into a home office. This would be awesome to win! We've just downsized and hubby and I moved a small house on to our property and then added on and completely renovated it. We're now at the furnishing stage. I need to fix up a studio that can be used as a guest room. I'd make over our dreary family room. It's waaaaay overdue! We just moved into a brand new house, wonderful, right, except every room in the house is the same color. I would love to paint the dining room, a room you can be daring and is a room everyone sees even if they just come to the door. We have just moved into a brand new house, wonderful except every room in the house is the same color. I would love to paint the dining room, it's the first room everyone sees even if they only get as far as the foyer. I love the look of this and I love that you showed the Sherwin Williams program as I was thinking of trying it myself and you reminded me to do it - can't wait now! I think I too would do my Master Bedroom. I have the same color in there as the rest of the first floor and I would like to personalize the space a bit more! I would absolutely redo our great room/dinning room. I would absolutely redo our family/dinning room. Where do I start!!? Pretty much every room in our house, except for my two girls' bedrooms (which were just painted). 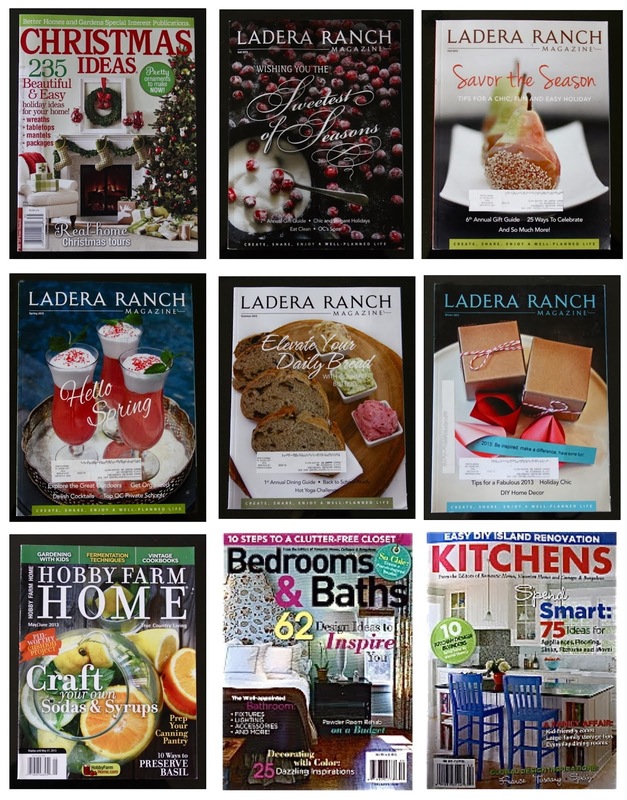 Love the colors on your mood board! Reminds me of the curtains I just bought (m.style Medallions Poly Duck Cloth Grommet Curtain Panel Pair). I would re-do my master suite. It's been the same for over 12 years! i would repaint our master bedroom, and also our daughter's pink bathroom while we're at it! I would makeover my basement entertainment/workout area, because it is still the same color I'm sure as when the builder painted it! I want to paint my bedroom gray and NEED to paint my sons room. Can't wait to see your completed bedroom. I would re-do our master bedroom. The poor room...It's the most forgotten room in the house! I would & will make over my master bedroom even if I don't win. I have the same type of ceiling as your master & never knew how to described it or what you call it. Now I know! I've also laid on my bed wondering how to paint it so I'll be very interested in seeing how you handle the paint. Right now the paint in my room stops at the top of the wall. I'm also inheriting a large king poster bed from my in-laws so there are changes in my future. I loved Sherwin Williams paint for my kitchen cabinets...coverage like a factory finish, Sherwin Williams will always be my paint of choice. We are now empty nesters and would love to paint and make over the two bedrooms that were our son's and daughter's when they were at home and they now use when they visit. Without a doubt, our master bedroom. HELP! I would run, not walk to a master bedroom re-do as well! It's a must as the next in line for updates. Mama needs a new sanctuary, I just have needed the motivation to tear down all of the existing wallpaper (blah) we've been living with since we bought the house. This win could kick all of that right into high gear though! Good luck with your redo and thanks so much for the opportunity! Can't wait to see your after! I would without a doubt do the living room/dining room, in s a cream color that I never really liked. I just moved and I would love to paint my unfinished sunroom. With summer coming up I am sure my boys will really enjoy having their friends over and hanging out there. We are just finishing our basement and could use some new touches to make it feel complete! We just moved and I would love to paint my unfinished sunroom. I think my boys will really enjoy entertaining their friends this summer, especially after the brutal winter we just had! If I won, we would definitely paint our orange oak cabinets in the kitchen! Thanks for the opportunity to win! With out a doubt, it would be the heart of our house -- kitchen and dining area. Something warm and happy. We close on our own Yellow Cape Cod (actually white) next month! It's a gorgeous 80 year old home on 3+ acres of lawn, gardens, full of fine details, character and Southern charm. It actually has a name, Oaklea and comes complete with a pergola and stray peacock! I'm so excited to begin re-decorating this stately home, and I'll start with trying out the Color Visualizer from Sherwin Williams and their Harmony Paint. Thanks for sharing your awesome blog! I would most definitely makeover my master bedroom. After 3 houses and 14 years of marriage, I have yet to have a decorated master. Of course my kids' rooms have been done two and three times and over as well as every other room in the house. I too have a ceiling very similar to yours that I look at and think "hmmm...what could I do with this?". The room has so much potential and I dream of making it into something beautiful. My 16 year old family room is in desperate need of a fresh look. I would makeover our 16 year old family room. It is in desperate need of an update. I would most definitely makeover my master bedroom. After 3 houses and 14 years of marriage, I have yet to have a decorated master. Of course my kids' rooms have been done two and three times over, as well as every other room in the house. I too have ceiling very similar to yours that I look at and think "hmmm...what could I do with this?". The room has so much potential and I think it's about time I shift my focus to finally creating a true master suite for my husband and myself! We have a whole house to paint but I think I'll be starting in the living room. My living room that is were I am focused right now. I really needs new paint to tie it all together. My living room is what I am concentrating on right now. That is exactly what it needs, paint. That would really being it all together. Oh that would me so giddy. The Master Bedroom - it needs a fresh look! I've been wanting to redo our bedroom. It has never been redone as this is the house I grew up in. It needs to be turned into a "master" instead of being our laundry room. $1000 would really help make it alittle more special. Since I am in the beginning stages of a whole house transformation I would start with either my Kitchen or Master Bedroom. I love the idea that it doesn't have the "paint" smell and that it can hide or eliminate other odors such as pets, etc. would be a great bonus. I would update my master bedroom. Love the look and feel Sarah created. I would update our living room. My master bedroom and master bathroom need an overhaul. The bathroom has a hole in the wall due to the towel bar falling down. And, since the bath is connected to our bedroom - everything needs an update. I love decorating, but just need help with these rooms! I would love to makeover my living room. And I'm not going to lie...I love the smell of a freshly painted space. I would paint my master bedroom. It has not been painted since we moved in our home. I would redecorate my upstairs bathroom. It has always been a challenge for me to come up with something that I am truly happy with in this room. Thanks for this chance. Love the colors! I would love to make over my master bath, and I would start with a new coat of paint! My room of choice for the next "freshing" is also my master bedroom, have already bought new bed and dressers, now I can Visualize it all together thanks to the Tool SW offers! This is so cool as I have new furniture so it is harder to visualize, not having put it "together" yet. SW is all I use and I am in need of a 1st floor paint REDO!!! Thanks for the step by step guide to the color visualizer. I would love a paint makeover. I can not afford Sherman Williams paint. I have never used it but heard it is great paint. I would love to lighten up my master bedroom. I just used Sherwin William's paint to redecorate my daughter's room. Now, my room needs a new look! i'd give my spare bedroom a makeover! Sherwin Williams's Visualizer prog is awesome! My bedroom is screaming for a makeover. It can stand how ugly it is! Our sunroom needs a major paint job. I'd love to makeover my daughter's room! I would love to make over my children's playroom, it’s a very bland color and just not an inviting space for them to play in! I would make over the kitchen and bring it more up to date. I would paint our bedroom for sure! Thanks! I would paint our bedroom for sure! Thanks!! I'd like to makeover the kitchen. I would makeover the kitchen. I would use it to paint furniture for my first rooms and an accent wall. I would makeover my master bathroom. I would make over my living room.